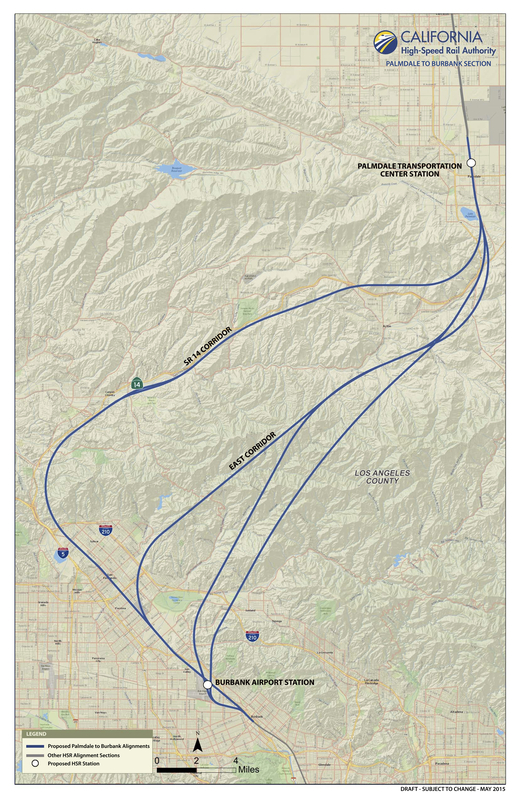 Routes being studied for the Palmdale to Burbank section of the bullet train’s route. Credit: California High-Speed Rail Authority. At the request of state lawmakers, the California High-Speed Rail Authority released a 2013 report from its consultant Parsons Brinckerhoff that estimated the initial cost to build the Burbank to Merced segment of the route had grown by more than $8 billion, not accounting for inflation. The increased costs and the perceived lack of transparency are a concern to Assembly and members of Congress and casting doubt on the viability of officials to manage the project. High-speed rail authority officials contend that the report was part of an “iterative process” and were preliminary numbers. They’re also on record saying they have been transparent with critical information to the public and that they’re still looking for ways to build the project below the the current budgeted amount of $68 billion. The billions of dollars being discussed are so unfathomably large they might start to lose their magnitude. So maybe it’s easiest to think of an $8 billion project increase as roughly the combined cost of the Purple Line Extension and the Crenshaw/LAX Line. From a city of West Hollywood staff report on the new shuttle bus. Click above to see the entire document. Good news for West Hollywood commuters. The West Hollywood City Council last night approved a new, free shuttle bus pilot program that will take riders from San Vicente Boulevard within WeHo city limits to the Hollywood/Highland Red Line Station in Hollywood. 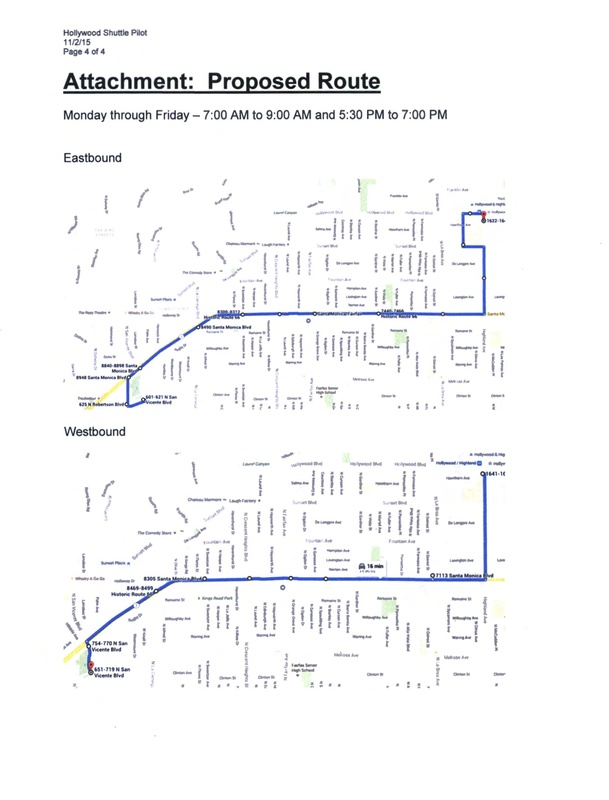 The new bus service will be aimed at weekday commuters with service running Monday through Friday during peak hours and frequencies of 20 minutes or so. The route begins/ends at San Vicente Boulevard and runs along Santa Monica Boulevard to Highland Avenue and heads north to the station. Service is expected to begin in January and is funded until June, when the ridership will be assessed. 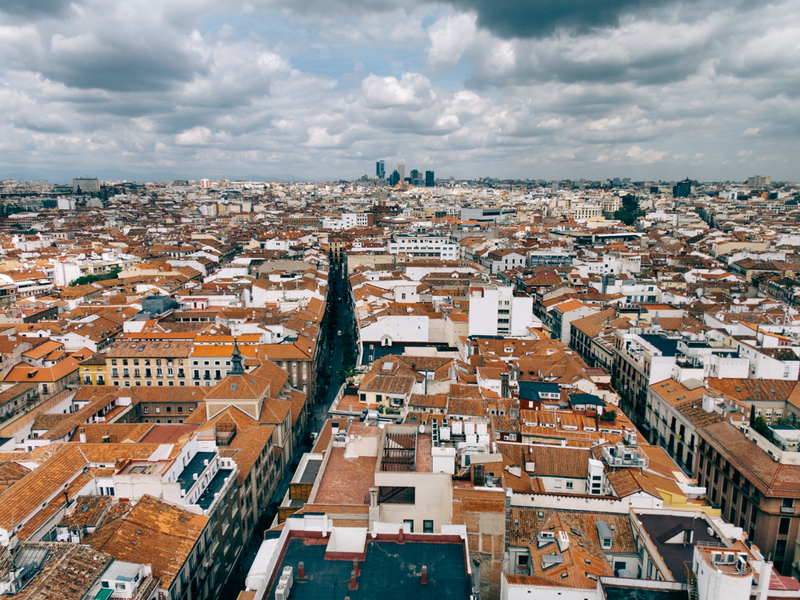 One view of Madrid. Photo by Jose Maria Cuellar, via Flickr creative commons. If on any single day, levels of nitrous oxide in central Madrid rise above 180 micrograms per cubic meter for more that two consecutive hours, a speed limit of 70 kmh (44 mph) will be introduced on the Madrid beltway. If this level continues for another day, non-resident cars will be banned from parking in inner Madrid. If nitrous oxide levels reach 200 micrograms per cubic meter on any day, measures will be stricter still. Alternate driving days will be introduced for the large area of inner Madrid called the “Central Almond,” where a third of the city’s residents live. If nitrous oxide levels reach above 400 micrograms per cubic meter (a level that Madrid has as yet never reached), then restrictions would be extended all the way to the outer beltway, effectively covering the entire city. The article’s sub-title calls banning cars a “drastic” measure, and yes, due to its potential to restrict cars throughout the entire city it is unprecedented. But in Europe at least, banning or limiting car use for a period of time to reduce pollution seems to be gaining acceptance. In fact, Madrid already does it in certain parts of its historic downtown and Paris recently banned cars for a day in September. It’s hard to imagine seeing something at this level in Los Angeles, but we have seen first-hand how reducing the number of the cars on the road works to quickly improve air quality. Remember Carmageddon? As for those thinking about free fares, Metro made about $351 million from fare revenues in 2015, according to this year’s budget. Total operations costs were $1.408 billion. The public policy dilemma is that free fares may very well encourage higher ridership but even in a subsidized system (typical of most American transit agencies), where would the money come from? 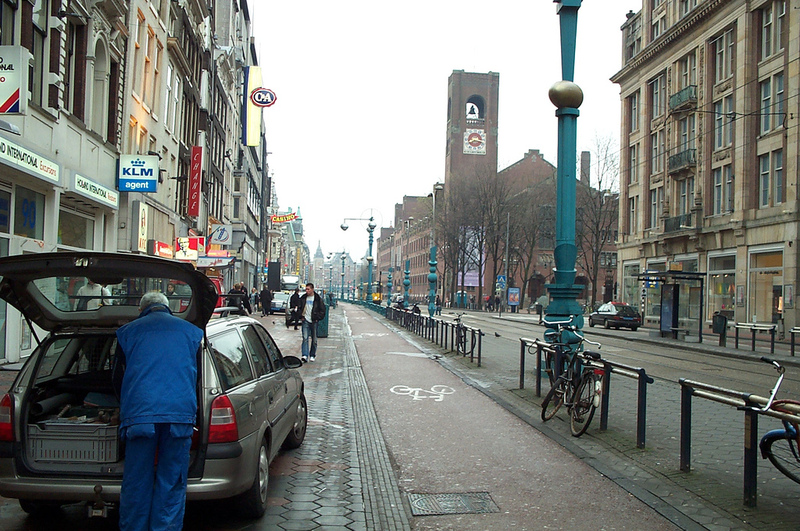 An Amsterdam street circa 2001. Photo by Jaren and Corin, via Flickr creative commons. Since we’re on the subject of banning cars from cities, check out this article with before and after photos of Amsterdam’s streets. The photos very simply highlight Amsterdam’s evolution from as a horse-and-buggy and automobile focused city with wide, open streets to one focused on walking and bicycling. It’s evidence that the city wasn’t always a mecca of bicycling and pedestrian activity, but that it took active planning to change it, and perhaps shows that even the most car-centric cities in America are capable of transforming themselves as well. I occasionally like to include a few aviation articles in this space because hey, planes move people too. Click the link to this article to see video showing a single-engine Cirrus airplane piloted by the former CEO of Wal-Mart slowly drifting to the ground after he deployed its emergency parachute due to engine failure. Both he and his passenger survived the crash-landing. Apparently, emergency parachutes have been installed on 30,000 Cirrus aircraft since the mid-90s, though only about 50 have ever been deployed. It’s estimated nearly 200 lives have been saved because of the parachutes. Now that I know one little mistake or malfunctioning widget no longer spells certain death, I think I’ll get my pilot’s license. On second thought, I’ll stick to being a passenger. Don’t count on seeing parachutes on passenger planes any time soon though. Cirrus aircraft are single-engine propeller planes that only seat two to five people and are much smaller and lighter than commercial airliners. 33bn to 68bn, and now 71bn and so on, and so forth. Its opening in 2022 though, and its already broken ground. Where do i buy a ticket? A Southwest Kiosk, thats where.. Despite the seemingly Europhile articles that The Source tends to lean towards, the question comes back on why should LA always and only follow Europe as examples of social progress, but completely disregard other examples from the rest of the world such as Asia, Middle East, South America, and Oceania who all run transit just as good, if not better, than the US or Europe one way or the other. Another way of putting it is that the European economy is in shambles, many European countries have high unemployment, in serious Euro debt and crisis, Volkswagen and other European automakers have been exposed to be nothing but cheats and liars, and they’re facing huge Syrian refugee problems that their governments can’t handle. European style social progressivism hasn’t worked at all and I certainly doubt a government to be so intrusive and authoritarian as to go so far to the extreme as to say “ban cars” will gain any traction here. Eight billion more for what? It’s a north / south route being detoured into Palmdale purely as a political payback. Palmdale cannot even support the airport built there decades ago. The most effective and economical policy to reduce costs is to continue adjacent to the Five Freeway clear to Los Angeles. Palmdale is serviced by Metro Link and travelers can go either to Los Angles to travel south to San Diego via the HSR or Amtrak to Bakersfield for northbound travelers. HSR is not supposed to be a commuter line but rather a high speed rail alternative to flying from LAX or Hollywood Burbank Airport. You can’t fly from Palmdale, why detour HSR there only to pick-up a small number of passengers. The lowest level that bicycling ever reached in Amsterdam of all trips was 25% in the 1970’s. Almost all cities in English speaking countries have no more than a low single digit share of all trips. Its much more difficult to take a lane away from motor vehicles to create a separate lane for bicycling if the mode share for bicycling is in the low single digits. Getting large UI.S. cities to the rate of bicycling that the Netherlands had at its low point in the 1970’s will take decades. Then it will take decades more to replicate the quantity and quality of bicycling infrastructure that the Netherlands now has.